who intended to publish them just for the fun of it--non-profit fun. But: Derleth got wind of this and sent him a very specific, long, letter stating on just how mnay counts he could be sued if the letters were not published according to his instructions--and his profit!--since the letters, being a part of the Lovecraft estate, are legally his. Walt, seeing the gallows staring him in the face, decide to change pulication plans. But, the amusing thing is this: Dereleth ended the letter on a 'sweetness and light' note; asked about "old deCastro's health," and said, "Don't think that I'm a hard man to deal with..." January 29th; 425th Consecutive Meeting: Forrest J Ackerman (sole owner of the ACKERMAN AUTHOR'S AGENCY) is agenting some stories for L. Ron Hubbard, of whom all of you have hears. Forrest had spent most of the previous night with that gentleman and had picked up a lot of biographical infromation from him. It seems that Hubbard had quite a few remarkable experiences at which his stories have only hinted, and one of them is that during an operation being performed on him for certain injuries received in the service he was actually dead for eight minutes! The astounded pause was well timed for in that moment who should walk in but Rex Ward and Roger Phillips Graham--the Rog Phillips of AMAZING STORIES! The incredible thing is--during the discussion that followed it was not Forrest who carried the ball forward into the enemy but Dale Hart. It was mostly a quiet argument, though. Very few derogatory remarks were made from AMAZING'S corner or form ours. No personal remarks were exchanged. Mr. Phillips let out quite a few definite statement, among them the following: "There isn't going to be any more Shaver Mystery two issues from now. On March 10, the April issue of Amazing will be on the stands and it will contain the summation of the Shaver Mystery, the proof of the Shaver Mystery, complete with photographs, letters, and so forth. Palmer's editorial will go something like this: 'We have definitely proved that the Shaver Mystery is the truth and since this magazine is devoted to fiction, rather than fact, we must discontinue it.'" 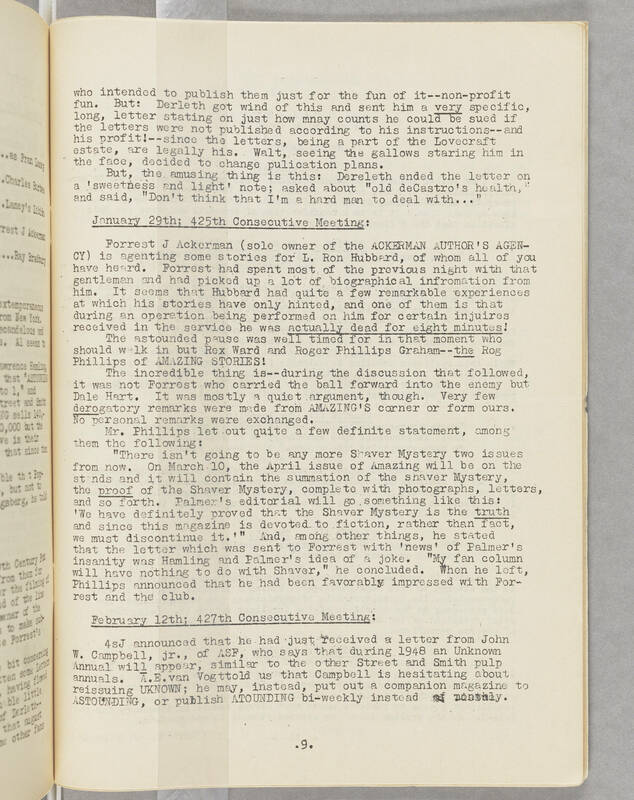 And, among other things, he stated that the letter which was sent to Forrest with 'news' of Palmer's insanity was Hamling and Palmer's idea of a joke. "My fan column will have nothing to do with Shaver," he concluded. When he left, Phillips announced that he had been favorably impressed with Forrest and the club. February 12th; 427th Consecutive Meeting: 4sJ announced that he had just received a letter from John W. Campbell, jr., of ASF, who says that during 1948 an Unknown Annual will appear, similar to the other Street and Smith pulp annuals. A. E. van Vogt told us that Campbell is hesitating about reissuing UNKNOWN; he may, instead, put out a companion magazine to ASTOUNDING, or publish ATOUNDING bi-weekly instead of monthly. .9.